Today's lesson is Elisha with the widow. We are discussing the miracle of the jar of oil filling lots of jars! And, the family that Elisha stayed with. Another miracle happened when Elisha brought their son back to life! Review: Last week we finished our studies about Elijah and started learning about Elisha. God told Elijah to have Elisha be the next prophet. Elijah and Elisha traveled together. They crossed the Jordan River together on dry ground! Then, a whirlwind took Elijah to heaven! Elisha watched Elijah leave and Elijah threw down his mantle (coat) for Elisha! Elisha hit the waters of the Jordan River and they parted. Elisha walked back over on dry ground! Today's lesson is found in2 Kings 4:1-37. There was a woman that told Elisha that her husband had died and the creditor was coming to take their 2 sons as slaves since she couldn’t repay money that she owed to them. Elisha asked her "What am I supposed to do for you? What do you have in the house?" She told Elisha that all she had in the house was a jar of oil. Elisha told her to "Borrow empty pots from all your neighbors everywhere. Not just a few, but every pot she could gather. When you go back to your house, shut the door and pour your oil into the all the empty pots and set the full pots to the side." She did what Elisha told her to. She borrowed all the pots she could. She took them to her house. When they had all the pots, she went into her home with her sons and closed the door. 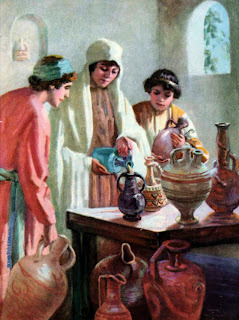 Her sons would bring her a pot, she would fill it, and then she would set the full pot with the oil off to the side. Finally, she told her son to bring another pot and he replied that they were all full! There isn't another vessel to fill! And, the original oil stopped running! That is a miracle! The widow (a woman whose husband had died) told Elisha that all the pots were full and he told her to "Go and sell the oil, pay off your debt, and live on the rest of the money you have left." In the same chapter, we are told this lesson about Elisha. Elisha would stay with this particular family when he was passing through Shunem. The woman would feed Elisha. She told her husband that Elisha was a holy man of God asked her husband if they could make a bed room in the upper room for him so he could stay there and be comfortable. One day after the son had gotten older, the son was in the fields with his father and his head started hurting. He was sent home and he sat with his mother until noon and then he died. But, when Elisha heard what she had to say, he told his servant Gehazi to go ahead of them to the woman's house and do not stop to talk to anyone. Elisha told Gehazi to lay Elisha's staff on the boy's face. When Elisha caught up with Gehazi, the boy still was not breathing. Elisha went back to the woman’s house. Gehazi went and brought his mother to see her son and she was so happy to see her son alive again! 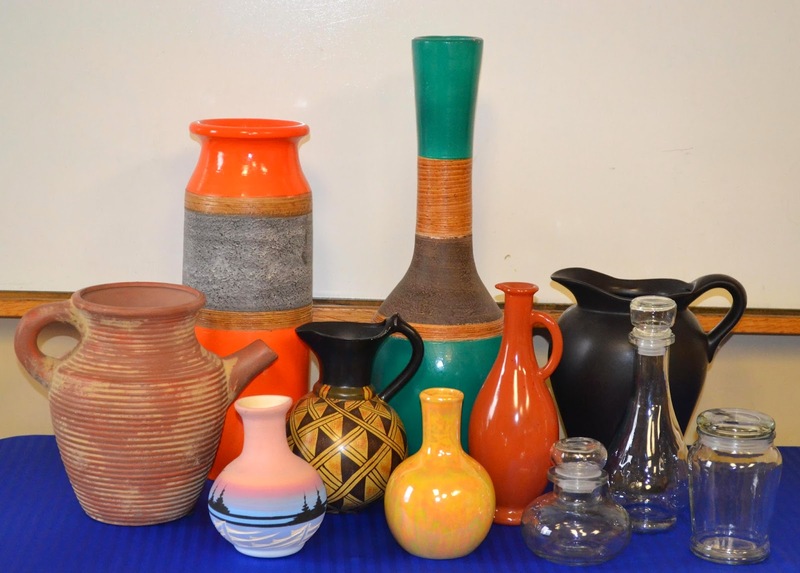 I set up all my jugs to use for this lesson visual! I have most of these in the tent and use them for different lessons. But, if you don't have any, maybe ask friends if you could borrow some? Then, you can tell the students you asked your friends and neighbors just like the widow did! I found these plastic jars at Hobby Lobby (on clearance) and I liked them because they have screw on lids. I had this set up on the same table, next to the jugs/pots. I used the larger jars to fill with oil at home, and we poured the oil into the kids smaller jars. I also talked about the miracle that she was able to fill lots of jars with I bottle of oil, but I couldn't do that. Click here to download and print today's worksheet. 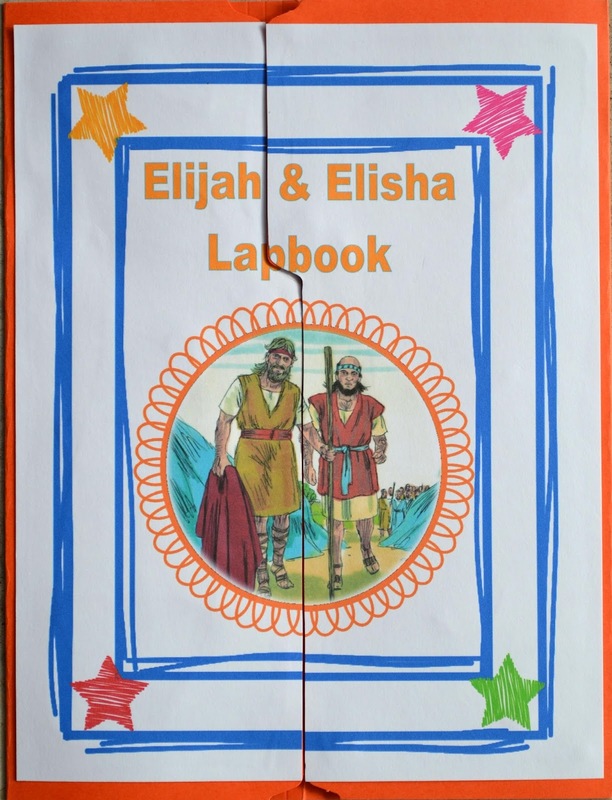 Click on the photo to see this lapbook that is being used with each of the Elijah and Elisha lessons. 2 Kings 4:7 and teacher's Bible verse visual. Great post and learning tool. I'm headed off to read 2 Kings 4 again now. Thanks for stopping by! I appreciate the comment! Thanks for hosting! I have used your resources and i want to Thank you for sharing . God bless you! Thank you so much for sharing these wonderful lessons. I have used several lessons with my children's classes at church. Great stories, crafts, and activities.